After my unofficial tablehopping crash course through New Orleans this summer, I was so fired up to learn how much the food and flavors there really had terroir. Like, where y'at? I was in NAWLINS, make no mistake, honey. I would love to move there for a few months, just to learn more about the food--the history is deep, and there's so much pride in their cooking, I just loved being fed there. And the best thing anyone can do right now is visit that incredible city--look for a jetsetter piece from me soon! My five-day trip took a couple years off my poor heart, but all in the name of research! I had po' boys to eat, muffalettas to scarf, and Sazeracs to swill! I can't wait to return to the Big Easy. Soon after I got home, I heard chef Brenda Buenviaje was opening her own place, aptly named ~BRENDA'S~, in the Lower Polk. What's the tie in? Well, Ms. Buenviaje was born, raised, and learned to cook in New Orleans. And then she told me about some crawfish-stuffed beignets she was going to put on the menu. Now, I have a sweet spot for Brenda, not only because she is an evil genius hell-bent on creating savory stuffed beignets, but also because she was my very first face-to-face chef interview some years ago while she was the chef at Café Claude (she probably didn't know that!). This tiny little slip of a spot is in the former Sun's Café space (there is a final homage to Sun's in the bathroom, in the form of a microwave cookbook). Brenda's is tiny like Dottie's True Blue Cafe, cute like Dottie's, tasty like Dottie's. And I foresee it's going to be busy as hell like Dottie's. The space has a red and black color scheme, with close tables, a couple old gleaming milk cans with fresh tree branches poking out of them, a whirring ceiling fan, wood floors, classic café chairs, a tiny open kitchen, and a long counter flanking a mirrored wall so you can watch yourself as you inhale your food. The music was quality, with jazzy crooning and blues, and the servers were friendly and helped add to the chipper neighborhood vibe. It almost has a Bar Crudo cozy coolness--kissing cousins? I'd been hearing how busy it was for lunch, but a pal and I found a table for two at 1pm just fine. Luck, perhaps? Well, I should count my lucky stars this place isn't in my neighborhood, because I'd be hankering for it way too much--and everything is priced quite kindly. I would be like, "Hey, it's foggy. Time for Brenda's." "Whoa, it's Wednesday, time for Brenda's!" and the most dangerous of all, "I'm hung over, time for Brenda's!" Brenda describes the food as French Soul Food served up in a Creole diner, and I'd add to that by saying the vittles here are authentic and homey, with a spunky point of view. Hipsters were tucking into hefty half-moon omelettes, and I loved seeing folks stumble in with tousled hair at 1:30pm for French toast and coffee. Since breakfast is served all day, night owls, here's a new afternoon roost for you. 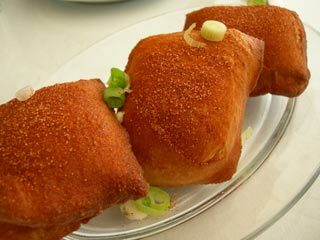 We started our lunch patrol with the crawfish beignets ($6), of course. A russet trio come stuffed with sweet crawfish, cheddar, and scallions, and are dusted with Brenda's own variation of Tony Chachere's Original Creole Seasoning--dare I say bam? Spicy! Meowza! My friend and I determined these are like Creole Hot Pockets, but gourmet. It will be tough to try the other three versions (plain, chocolate, apple), but I'll find a way. Heh. The totally illegal item on the menu is one of her homemade biscuits ($1.50). Like, "Uh, ma'am, pull it on over. Are you aware of how much butter and cream you are putting in your mouth?" "Uh, sowwy officew, my mouth is fuwl of dewicious biscuit, can't tawk. Oh, sowwy about the cwumbs." Brenda said folks are falling in love with these biscuits, and what's not to love? Better than falling in love with some of the other neighborhood offerings, ahem. She did her own twist on a Fannie Farmer biscuit recipe--they are like a hot boy in the 70s, all golden, tall, and flaky. Even better with some homemade jam smeared on them, like the chunky and not over-sweet grape version that still has some whole grapes in it (now I really like grape jelly) or the strawberry, thoughtfully placed in little ceramic pots on the tables. So if you have a choice of toast or biscuit, now you know your answer. And for the record, I'm not one of those crazy biscuit people. But now, I just might become one. Of course I went for the po' boy, requesting a 50-50 mix of fried shrimp and oysters ($8.75)--see the terrible things I learned in NOLA? The seafood had a good cornmeal crust and was cooked just right, but I just wanted a few more oysters and shrimp thrown in there (probably best to forget the mother lode sandwiches I had in New Orleans). I was loving the hearty slathering of the chipotle remoulade, and the buttered and toasted bun is a nice touch. Sadly my side of fries weren't very hot, but my friend's coleslaw was fresh and light. We wrapped things up with a café au lait ($2.25), a much-needed caffeinated finish to help elevate us from our encroaching food coma. Also tasted the house-made sweet watermelon tea ($2.25) with Thai basil and orange pekoe tea, quirky and refreshing. • the burger made with tasso. • the croque monsieur (but make mine a madame, thanks). • the grillades and grits. • any of the omelettes, but especially the andouille and cheddar version, with sauce piquant. • oh, and I guess there's no getting out of there without eating some more crawfish beignets and biscuits, woo hoo.